Have you ever had a manager or business leader expect an 80% Forecast Accuracy? Or, as part of your performance review had a supervisor explain that current forecasting performance is at 48% and the goal is 75%? Has anyone in your business ever analyzed the historical sales patterns and the natural variability of your customer demand? Did you know that the tendencies and variability of your demand is a key indicator of the accuracy and attainability of your forecast? 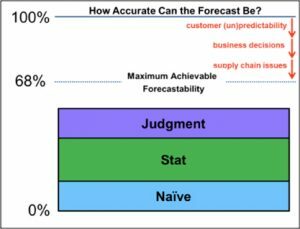 Although all businesses typically gauge supply chain success using Forecast Accuracy as one of the primary measurements, understanding what is really achievable is just as important as the current result. Forecastability is the term that describes the potential accuracy of your forecast. In other words, how hard or easy it would be to predict future demand based on the variation of your history. Why would anyone expect a forecast accuracy of 100% when the forecastability of the business is only 68%? Many internal and external factors can impact the behavior and pattern of our historical demand. Customers can be unpredictable and not place orders as promised or expected. Internal supply chain issues, product availability or distribution challenges may impact our ability to fulfill demand. In addition, internal business decisions on whether to fulfill, or produce/purchase, to accommodate demand may also have an impact. The historical demand variability (orders and/or shipments) of the business correlates with the maximum forecast potential. Calculating the Coefficient of Variation (CoV) will tell you the rate or percentage of demand variation. Once you know the CoV, subtract that from 100% to determine the forecastability. CoV is defined as the ratio of the Standard Deviation (σ) to the Mean (μ). It measures the dispersion of the data points around the mean and helps show how much volatility (or uncertainty) your historical demand has. Let’s Look at a Real-Life Example! This graph shows cleaned sales order data aggregated to a product family level for the last 12 months. The average order quantity across the last 12 months is 2,896,697 units. The standard deviation for the last 12 months is 565,278. Dividing 565,278 by the average gives us a CoV of 19.51%, meaning the variation at the product family level across 12 months is almost 20%. Therefore the maximum forecastability for this product family would be 80%. In this example, expecting Forecast Accuracy for the product family or the products within the family to be better than 80% is not reasonable. There could be some products that are less variable and could achieve a higher accuracy rate, but overall most items and the maximum potential for the family itself is 80%. Now, understanding the factors affecting the variability and being able to change them is a different story altogether. For more information about CoV feel free to visit our website and webinar session titled “Variability Matters”. The webinar explains methods for calculating CoV, comparing results, determining segmentation strategies and applying results to optimize business planning. Click here to watch and download the webinar.